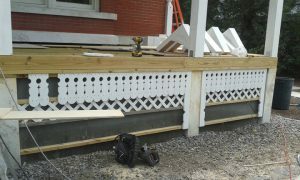 An Amish contractor who Charlie previously worked with requested his CNC machining expertise on a porch restoration. “The house is in an area of million dollar historical homes and it was sort of the ugly duckling,” Charlie commented. 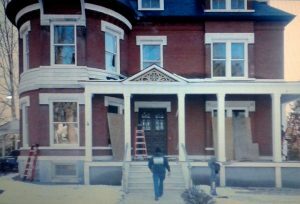 Inside contained original carvings, marble headers, marble walkways and molding, most in great condition. 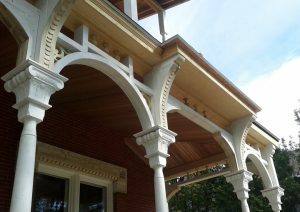 Charlie’s task was to recreate the porch to its original ornate form. His starting point? A few old grainy photographs and a small section of the original porch skirting. His preferred method? Aspire software and a ShopBot. 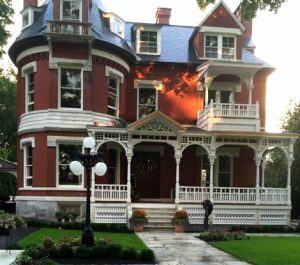 Built by a gentleman around 1890 who made his fortune in the hotel business in upstate New York, the house lost its decorative exterior over the years while keeping much of its exquisite interior. 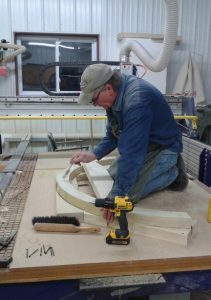 Charlie’s previous experience CNC machining outside corbels and inside molding on historic homes helped but this was the most extensive he’d undertaken. Installing the porch skirt, which was the only real piece of the house left Charlie could use as reference. Working in Aspire, he first made the basic 2D shapes of the forms, emailing digital images to the owners who were in Florida for the winter. 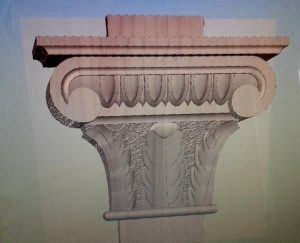 Then he worked on the 3D modeling, sending those for approval. 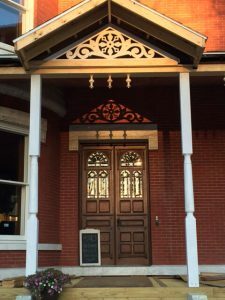 He took cues from the home’s interior carvings. “Everything I did the owners seemed to like. They were amazed at what the software and machine could do,” he said. Half of the 3-month project was completing the computer designs. “The customers wanted to be able to hold up the photo and see that reflection. 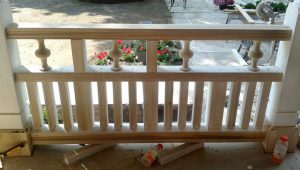 That’s what I tried to do.” The porch skirting ended up an exact replica and the owners were thrilled with the final result. Three of the leaf sections were machined in a clamshell ‘C’ with the 4th machined separately. It took about 2 hours per side using a 1/2″ ballnose for roughing pass and a 1/8″ ballnose for finishing pass with a 60 degree Vbit used for the leaf veins. Charlie took advantage of Talk ShopBot, the ShopBot user forum. Though he doesn’t actively post or comment, he’s gained a lot of insight and tricks from reading it regularly. 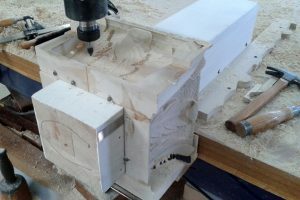 Charlie purchased a barely used PRS Alpha with a 12” z-axis about five years ago from someone off the forum, with an indexer that had never been set up. “I used a lot of clipart 3D carvings initially just to learn,” he says. That year a lot of friends and family received great Christmas gifts. 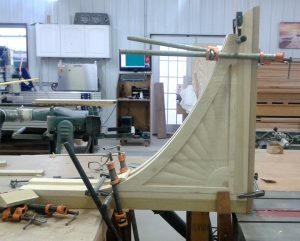 For this project, Charlie needed the indexer to be on the X-axis to machine the 11.5 foot posts. “My biggest challenge was getting the post-processor to know where the indexer was since it was not on the y-axis. I got some help from Brady Watson’s old posts on the forum and a few others.” Truing everything up to within a thousandth of an inch took half a day, which, on something that long, a mistake would be noticeable. He also worried that the motor might not handle the weight, so he again queried the forum and got a positive response. “I was really impressed with what the little motor could handle. It handled cypress and everything with no problems,” he said. 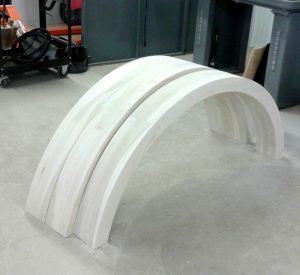 The 6 foot arches needed were done in sections, each 2 inches thick: He laminated them in layers inbetween machining. 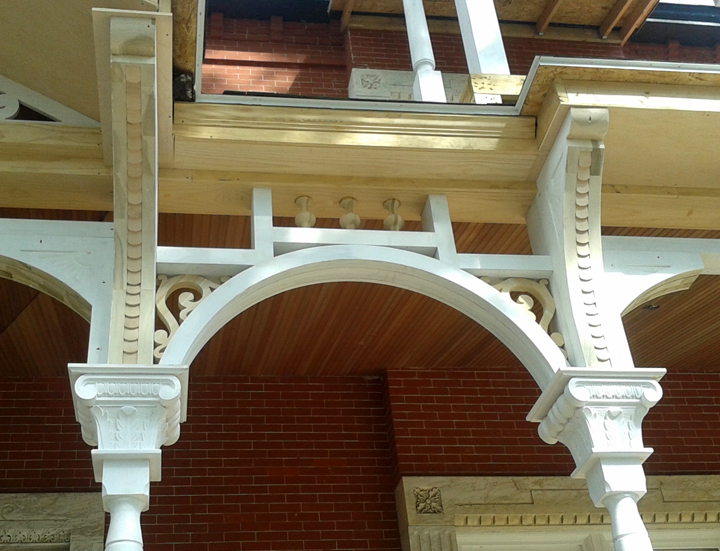 Installed 6 foot arches, corbels and 4-part leaf sections. At his job during college, Charlie worked in a spring manufacturing plant. He was studying industrial arts education by day and spending time in his mentor’s pattern shop on the weekends. The college job ended up becoming his real job for 35+ years. Taking business classes and working his way up to become plant manager, an upper management position, he finally left. He’d had enough of the stress. 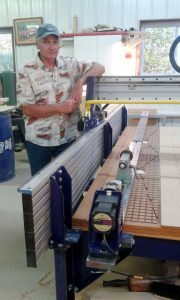 Charlie always kept a woodworking shop and with his mechanical background, CNC seemed like a natural transition for him. He’d attended woodworking shows and new the ShopBot name. Since that time, he’s completed Rhino classes, attended McGrew’s Aspire Camp and plans on attending the Vectric User Group in October. 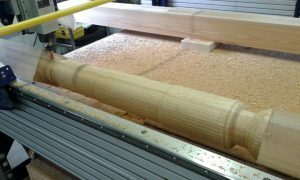 The 11.5 ft. posts were turned using a 5/8″ ballnose for roughing then 1/2″ ballnose for finishing. 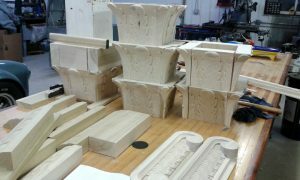 Machining times ran about 5 hours per post with very little sandy needed. “My interest lies in the critical thinking of how can I do this or that on my machine,” he says. 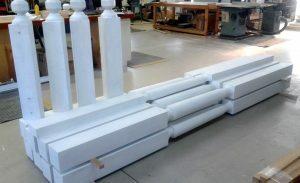 The 4-part leaf section is a perfect example of this: All pieces were designed so the contractor could assemble them on location (see leaf machining photo above and caption for details). Now with a horse farm way out in the countryside, he does commissions and other “weird projects” that he picks and chooses. “Technology is so amazing that I wish I had more time to play with it. I love taking classes and learning more. I’m just excited about what is available now,” he reflects. 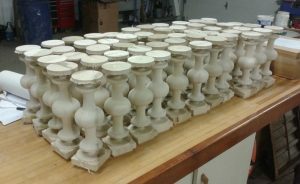 “There’s always been value in making something.” Charlie plans to do more restoration work using the ShopBot to overlap the boundaries of historical work and digital fabrication. 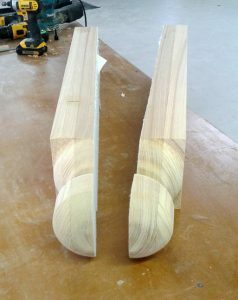 Split turned newel post: Charlie glued them up with paper in the center, which allows for easy separation on the center of the turning. Half the post was mounted on the wall with the hand rail attached to it. The original top medallion was found underneath some siding but still had to be replaced. Finished install: Now for the final painting. 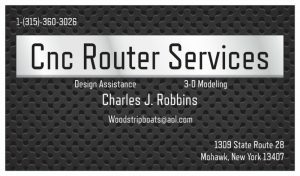 Feel free to contact Charlie for your CNC needs.